Venezuela Agents Arrest Opposition Leaders In Midnight Raids : The Two-Way A day after a vote granting President Nicolas Maduro near-dictatorial powers, agents of Venezuela's intelligence agency seized two key opposition figures in Caracas. 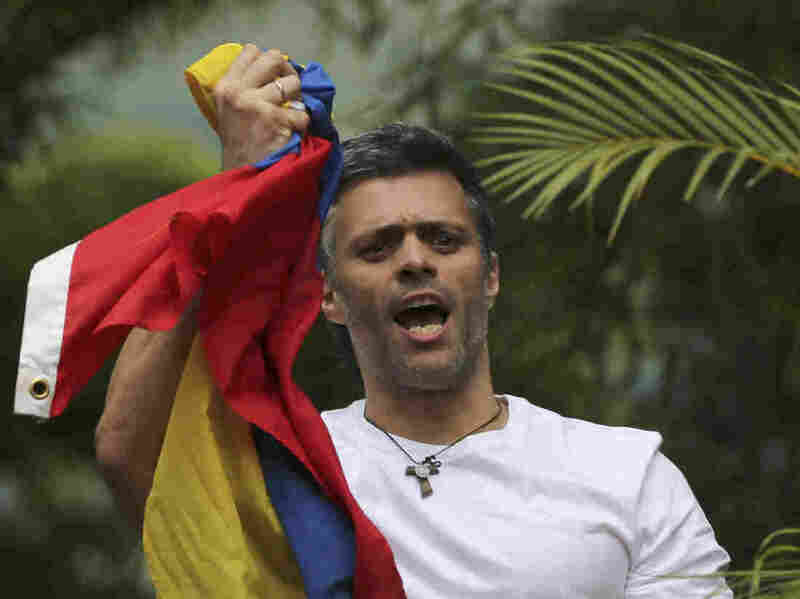 In a photo taken last month, Venezuela's opposition leader Leopoldo Lopez holds a national flag as he greets supporters outside his home in Caracas, Venezuela, following his release from prison and being placed under house arrest after more than three years in military lockup. Venezuelan security agents arrested two key opposition leaders in a midnight raid on their homes, making good on President Nicolas Maduro's promise to crack down on dissent following a vote that gave him broad authoritarian powers. In the middle of the night, armed men took Leopoldo Lopez and Caracas Mayor Antonio Ledezma from their respective homes in the capital. The leaders had been highly critical of Maduro and had only recently been released from jail on politically motivated charges. The two, however, remained under house arrest. The wife of Leopoldo posted a video on Twitter showing flak-jacketed agents bundling her husband into a vehicle marked "Sebin" — the name of Venezuela's intelligence agency — and then speeding off. "They've just taken Leopoldo from the house," Lilian Tintori wrote in one tweet. "We don't know where he is or where they're taking him." Ledezma's daughter, Vanessa Ledezma, also tweeted video that apparently shows the arrest of her father, taken from his home in pajamas. A woman in the video can be heard screaming, "They're taking Ledezma, they're taking Ledezma, dictatorship!" Leopoldo and Ledezma had denounced Sunday's vote to change the constitution and grant Maduro new powers, labeling the poll undemocratic. The vote authorized the creation of a Constituent Assembly. 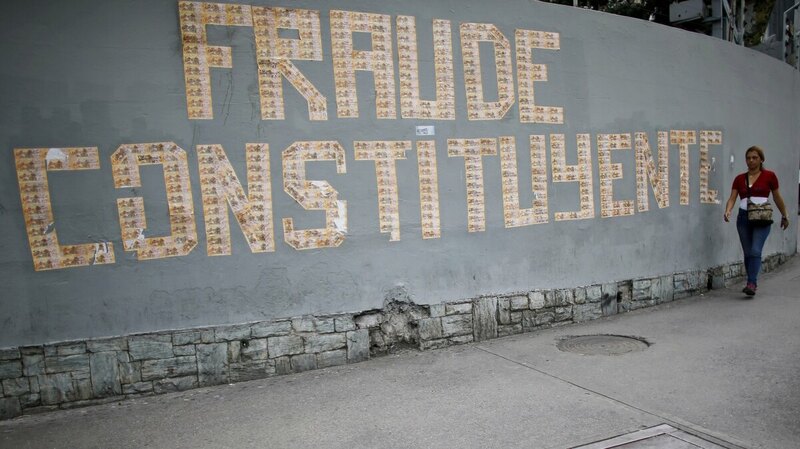 A pedestrian walks next to a message on a wall formed with Venezuelan currency that reads in Spanish: "The Constituent Assembly is a fraud", in Caracas, Venezuela, on Monday. As NPR's Philip Reeves reported on Monday, the vote, which went in Maduro's favor after an opposition boycott, ensures the president will have a free hand in the country's affairs. "The way that the election was set up ensured that this would be a body that is packed with supporters of Maduro and the ruling Socialist Party," NPR's Philip Reeves explained on Morning Edition. Tuesday night, President Trump condemned "the actions of the Maduro dictatorship." "Mr. Lopez and Mr. Ledezma are political prisoners being held illegally by the regime. The United States holds Maduro – who publicly announced just hours earlier that he would move against his political opposition – personally responsible for the health and safety of Mr. Lopez, Mr. Ledezma, and any others seized. We reiterate our call for the immediate and unconditional release of all political prisoners." On Monday, the Trump administration imposed sanctions on Maduro himself, marking only the fourth time that the U.S. has sanctioned the sitting leader of another country. In announcing the sanctions, National Security Advisor H.R. McMaster referred to the "outrageous seizure of absolute power through the sham election of the national constituent assembly" and said of Maduro that he is "not just a bad leader. He is now a dictator."